These Republicans do show that evolution doesn’t necessarily select for intelligence. 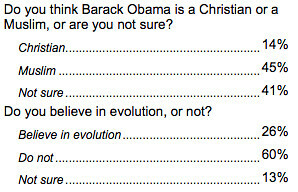 Posted in Barack Obama, Evolution, Polls. 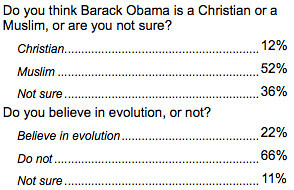 Tags: Barack Obama, Creationism, David Weigel, Evolution, Republicans. RSS feed for comments on this post.. TrackBack URL.